On December 19th 1999, actor Desmond Llewelyn lost his life in a tragic road accident when the car he was driving was involved in a head-on collision with another vehicle. He was 85 years young. Everyone at 007 MAGAZINE had known Desmond since our first meeting with him in the early 1980s, and over nearly two decades I grew to know him very well. His sudden death affected us all deeply, as it did the world of James Bond fans who had grown to love him in the role of Q. Fans worldwide were beside themselves with grief and had difficulty coming to terms with not only the violent nature of his passing, but also that he should be taken from us at the height of his fame and, because he showed no sign of slowing down in his ninth decade; his energy levels at 85 would have put many men half his age to shame! Desmond made the role of Q his own, and from 1963 to 1999 supported no less than five James Bond actors: Sean Connery, George Lazenby, Roger Moore, Timothy Dalton, and Pierce Brosnan. Shortly before his passing People magazine asked him how long he intended to continue in the Bond series: "As long as the producers want me and the Almighty doesn’t." Desmond always supported the James Bond themed events I organised at Pinewood Studios from 1990 to 1998 and would also sometimes visit our offices, where on one occasion he recorded the amusing dialogue for our then automated telephone lines. His support was always very much appreciated and we would reciprocate when possible by arranging lucrative public speaking appearances for him. On the day and through the week Desmond passed I received many emails, letters, and cards from 007 MAGAZINE readers offering their condolences and wanting to voice their feelings about his passing. Taking Desmond’s death very hard at the time, and also because of personal problems of my own, I felt unable to deal with the influx of other people’s emotional outpourings. Now, 13 years on, after re-discovering the file in which I kept their condolence correspondence, I thought the time was long overdue to leave some permanent record on the 007 MAGAZINE website in the form of a memorial tribute to my kind friend Desmond Llewelyn - our Q! ABOVE: (left) Desmond Llewelyn's first appearance as Q in From Russia With Love (1963) [with Sean Connery as James Bond]. (centre) Desmond Llewelyn as Q in Thunderball (1965) and (right) his final appearance in The World Is Not Enough (1999) with Pierce Brosnan as 007. “It was with great sadness that I arrived home this evening to hear that Desmond Llewelyn had been killed in a car accident. As Q he gave much pleasure to me and to countless others around the world. As the scrap dealer in Chitty Chitty Bang Bang he still delights my own children today. I was fortunate to meet Desmond at Pinewood at one of your events a few years ago. As with all stars, I could but stand back and watch him, disbelieving that I was with someone who had for many years been this larger than life character on the screen. Finally, I had the chance to ask for his autograph, which he did with pleasure. Then I realised that I should have asked for a photo with him. Half-expecting a testy brush off, I was pleased to find that Desmond was not like this at all. He was very generous and took time to pose for the photo. I am glad that I took that time to thank him for the pleasure he brought to me and to the countless fans around the world through his work. ABOVE: (left) Desmond Llewelyn as Coggins in Chitty Chitty Bang Bang (1968) directed by Ken Hughes from Ian Fleming's novel. (right) Desmond at his Bexhill-on-Sea home with many gadgets from the James Bond films. “I have just heard that Desmond Llewelyn has died tragically. This makes his appearance in the last film very ironic. He was a true star. “I woke up this morning to the news that Desmond Llewelyn had been killed in a car crash and feel absolutely terrible about it. This is not a suitable way for a life to end at the age of 85. This very sad day marks the passing of someone who genuinely made each one of the James Bond films in which he appeared (regardless of overall quality) a little bit brighter. The Bond films are one of the few things in life that I can say I truly enjoy without question, but I know I will always feel like something is missing from this moment on. “The best gadget to come out of the James Bond movies was not really a gadget at all. It was a man, and his name was Q. Thank you Mr. Llewelyn for bringing so much magic to a classic film series. ABOVE: (left) Desmond Llewelyn as 'Q' in Diamonds Are Forever (1971), The Living Daylights (1987) , (right) the GoldenEye image used on the cover of Sandy Hernu's biography 'Q - The Biography of Desmond Llewelyn' (1999). And the world becomes just that much more sad. The Almighty must have seen all the good work done in the lab. “Everyone else is saying the same thing, but I just wanted to add my feelings as well. “He’s one of the only reasons I watched Bond movies. This is truly a sad day for Bond fans all over the world. We all love you Mr. Llewelyn, and will deeply miss you. I’ll always remember him for his funny interactions with Bond. I’m really going to miss the fellow. His appearances always made me laugh and smile. and left me laughing out loud. and thanks for 17 great performances! “My condolences go to Desmond’s family and friends. I will miss Q dearly. I might be young (14) but Q still made a huge impact on my life as he did for Bond and everybody else. May he rest in peace. I think that the farewell in The World Is Not Enough was fulfilling. I live in Sydney And I just heard the news on TV. Even my brother, who’s 6, knows who he is. 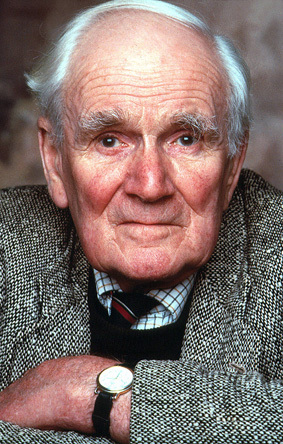 It’s just a sad day for everybody, not just Bond fans, as Desmond Llewelyn gave so much. He will always be with us in spirit and as long as Bond goes on, we will forever remember him as our gadget man. “Wherever you are, know that we love you and miss you, that we honor your memory with more respect that we would give most heads of state, and that your family need never want for sympathy in their great and terrible loss. We share that loss as best we can, as observers, as fans, as fellow human beings, and lastly, though most of us never knew the man beyond his simple shadow cast on the pale white of a theatre screen, with all the respect we can muster, as friends. “My condolences to the family of Mr. Llewelyn. “You gave us so much enjoyment. “Desmond Llewelyn’s scene in The World Is Not Enough made me choke. Surely, I thought, this can’t really be his last appearance, there’s life in the old boy yet? Sadly, today, Desmond has been taken from us, and in the most tragic of circumstances. “I have just heard the tragic news about the sudden death of Q. I have been a big fan of James Bond for as long as I can remember. It seems so unfair that he should leave us this way. I recently watched The World Is Not Enough in which Desmond shone. I will always remember him as one of my favourite characters in the Bond films. It is sad that he was only recently talking about possibly not being up to doing the next film, and he was there for his fans right up to the end at his book signing. 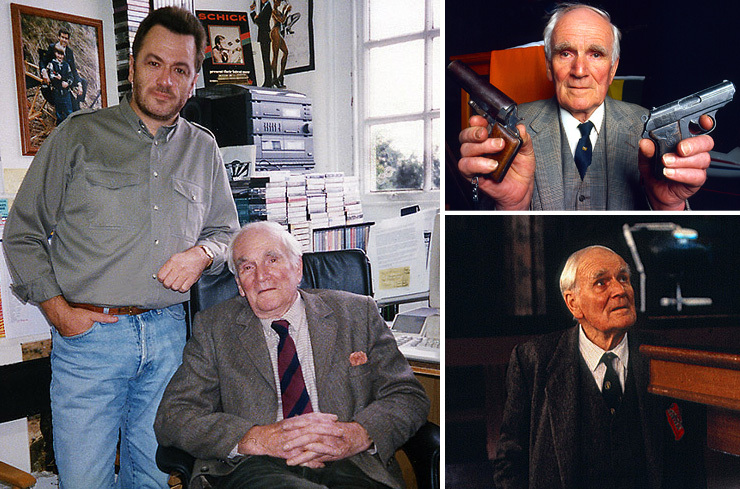 ABOVE: (left) Editor & Publisher Graham Rye photographed with Desmond Llewelyn during one of the actor's visits to the 007 MAGAZINE office. 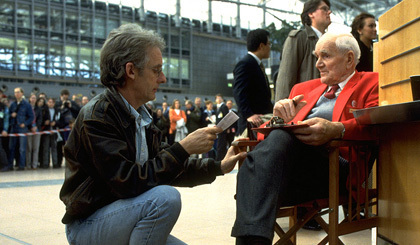 (top right) Desmond Llewelyn at the 1990 James Bond convention at Pinewood Studios, and (bottom right) Desmond's final scene as Q in The World Is Not Enough (1999). “I was deeply shocked to hear of Desmond Llewelyn’s death. Q was my favourite character in the James Bond films. The beginning of the year 1999, in a letter I ask from him a photo with his signature. He send me one shortly, and dedicated to me with his best wishes. “Through the pages of 007 MAGAZINE I would like to pay tribute to Desmond Llewelyn, somebody whom I knew as Q and also as a friend. Desmond was a truly caring and generous person and our paths crossed many times. We appeared in a couple of TV documentaries together and one of these I had the privilege of filming at his home in Bexhill. Desmond was also good enough to open my 1995 exhibition ‘From Eastbourne With Love’, something a lot of actors would not have done. Just days before his tragic death, he had come to see me at Battle Abbey as he wanted to film scenes for the HTV programme ‘Life of Q’. Sadly, on the day I had flu and was not on duty. Desmond’s biographer, Sandy Hernu, later told me he had been disappointed not to see me. I am sorry to see Desmond leave us like he did. HE was a Great man to us all. James Bond pictures will never be the same without him. Even though Q in the J.B. movies is not supposed to like J.B. you can see through the years that Desmond did like His relationship with James Bond. “Monday 20 December ’99 is a day that is still fresh in my mind. That morning I heard the shocking news about the tragic death of Mr. Llewelyn. My brother and I want express our condolences to his family. May his relatives find comfort in the idea that people all over the world mourn his loss. I also would like to express my sympathy to you and the employees of your Club, as I know Mr. Llewelyn was closely involved with the conventions and other Club activities. For Desmond - our Q. “I write with great sadness and shock in hearing about the sudden tragic car accident of Desmond Llewelyn, actor from the James Bond movies. I had just received his biography only two weeks ago. I am deeply saddened by his passing.